Dress 3, originally uploaded by the workroom. This was actually the first dress I made this spring. I made this in the Simple Wrap Dress class taught by Sarah. The pattern was originally a frumpy Vogue pattern, but Sarah modified it to be the sweetest little frock. I’m not sure how many of these she has made, but she’s got it down to an exact science. The dress looks great on everyone who makes it. This was the perfect opportunity to use one of my all time favourite fabrics. 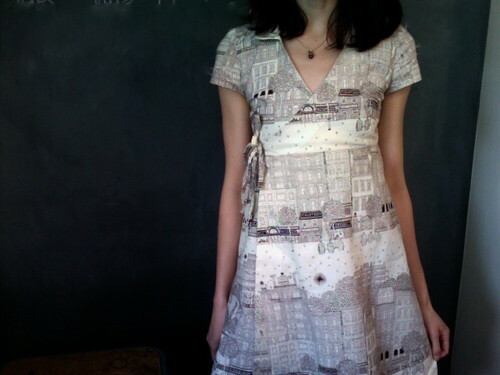 I wish more fabrics were like the City Limits collection. The illustration style is whimsical and the repeat is so large that it feels more like an art piece. I have a known weakness for cityscapes, so this fits right into my growing collection. Cute, cute, cute. 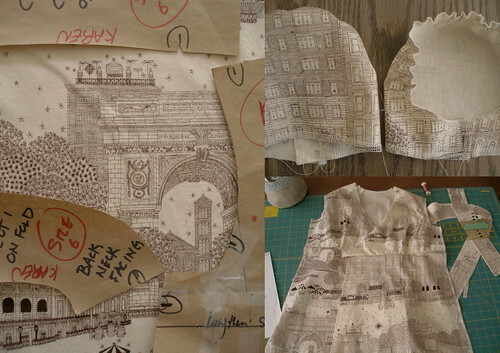 That fabric also looks like it might be from a Madeline book…thanks for the fabric design tip! Beautiful! How does it do for a large-chested lady? Jenny – Thanks! We’ve had all sizes take this class and it always looks perfect on everyone. The key is that the teacher, Sarah, does a spot on fitting with each person.